The American West conjures up images of pastoral tranquility and wide open spaces, but by 1970 the Far West was the most urbanized section of the country. 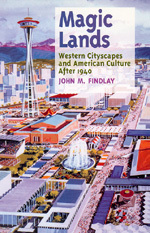 Exploring four intriguing cityscapes—Disneyland, Stanford Industrial Park, Sun City, and the 1962 Seattle World's Fair—John Findlay shows how each created a sense of cohesion and sustained people's belief in their superior urban environment. This first book-length study of the urban West after 1940 argues that Westerners deliberately tried to build cities that differed radically from their eastern counterparts. In 1954, Walt Disney began building the world's first theme park, using Hollywood's movie-making techniques. The creators of Stanford Industrial Park were more hesitant in their approach to a conceptually organized environment, but by the mid-1960s the Park was the nation's prototypical "research park" and the intellectual downtown for the high-technology region that became Silicon Valley. In 1960, on the outskirts of Phoenix, Del E. Webb built Sun City, the largest, most influential retirement community in the United States. Another innovative cityscape arose from the 1962 Seattle World's Fair and provided a futuristic, somewhat fanciful vision of modern life. These four became "magic lands" that provided an antidote to the apparent chaos of their respective urban milieus. Exemplars of a new lifestyle, they are landmarks on the changing cultural landscape of postwar America. John M. Findlay is Associate Professor of History at the University of Washington and the author of People of Chance: Gambling in American Society from Jamestown to Las Vegas (1986).